The main URL of the system (myetudes.org) is the Gateway where all users of the system log on. On the Gateway, you will find links to important information, as posted by the system administrator, including Message of the Day from the system administrator, system requirements, such as supported browsers and related settings, login tips and help, request to reset one’s password, site searches, and other related information. Instructors and students cannot alter or edit information on the Gateway page. On the Gateway page there is a very cool marketing tool: the Sites Browser tool. 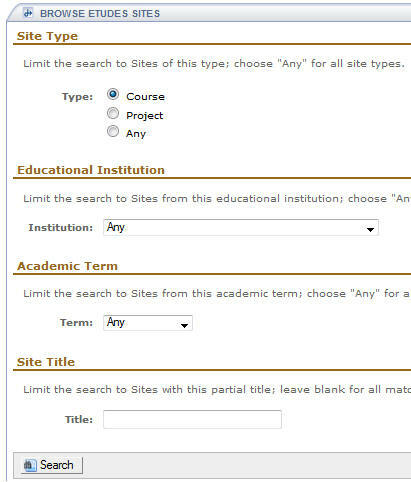 Students and faculty can search for courses and preview material, if marked ‘public’ by site owners. Anyone can search for courses. There is no need to log into the system before browsing around. Click on Browse Sites to explore public content in sites. The Search for Sites dialog box appears. You can search for courses by any term by choosing the term from the drop-down menu. Or you can leave the default at Any to find courses offered throughout the year. If you want to search by subject matter or institution, type that information into the Search for: box. You can also narrow down your search by institution. If you are looking for specific course offerings, you will need to know your college’s subject abbreviations (i.e. ENG or MAT or SPA). Then click on the Search button. 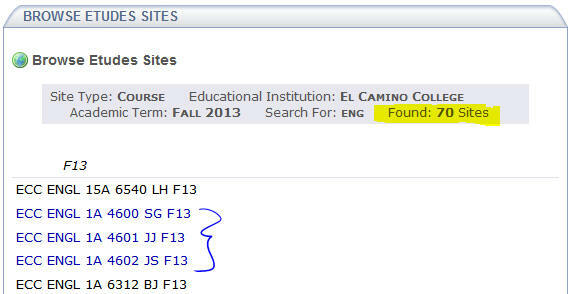 A search for ENG, Fall 2013, for El Camino College, returned 70 searches. The Results page will list all the courses that meet your criteria. In the partial list above, you can see that some of the courses are hot links and a couple are not. The ones that you can click on to preview material are published and available. The others are not yet open. To view information about the course, click on the course title in the list. If you wish to search for another class after you’ve completed one search already, click on the Search link at the top of the list of classes window. You may need to Return to List to see it if you’ve viewed a class page. Further down on the page, the instructor may have the syllabus, handouts, and other resources available publicly. The information that appears on a Sites Search page is created by instructors. There are three areas where you can choose to make information available to the public: Announcements, Syllabus, Resources. Each of these three tools offers you the option to make material publicly viewable. 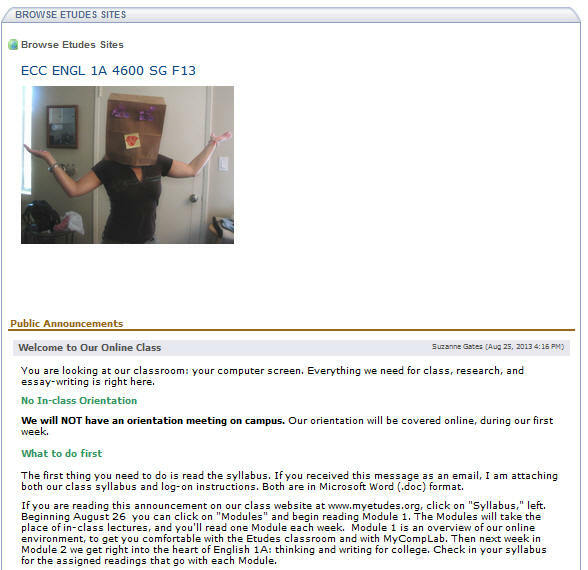 When you create an announcement, a syllabus item, or a resource, just be sure to check the correct option if you want it to be available to the public. Additionally, your Home’s information (photo, video, etc.) is visible to searchers in Sites. To log into the system enter your user id and password in the fields at the top of the page and click the Login button. You will gain access to your Dashboard and any sites in which you are a student, instructor, or other participant. On the Gateway page, in the left menus area, there are two links to help if you’re having problems logging in. The Login & Other Help page lists tips as to why you may be having a problem. There are also links to various school’s help pages for more information. The Reset Password link allows you to request your password to be reset to a generic password, in case you have forgotten the original. ​If you have forgotten your password, it can easily be reset. Click on the Reset Password link in the left menu on the Gateway. Simply put in your email address and click the Send New Password button. A new, computer-generated password will be sent to your email account. The response is instant. If you didn’t include an email account when you first enrolled for an online class, the system doesn’t have your address so you won’t be able to ask to have the password reset. In that case, you’ll need to request to have your account updated, by completing a form under Login and Other Help.